Al-Khafsah (Arabic: الخفسة‎), also spelled Khafsa, is a village located 77 kilometers (48 mi) east of Aleppo in northern Syria. In the 2004 census, it had a population of 5,393. 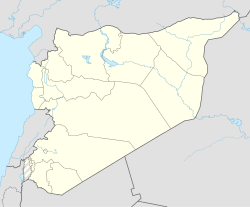 Al-Khafsah is the administrative center of Nahiya Al-Khafsah of the Manbij District. In June 2016, the village was under control of ISIL. On 8 September 2016, ISIL evacuated its headquarters in al-Bab and moved it to Al Khafsah with dozens of vehicles carrying militants and weapons. This came a day after Turkish-led rebel forces expressed their goal of capturing al-Bab. On the evening of the 7 March 2017, Khafsa has been liberated by the Syrian Arab Army (SAA). ^ a b "2004 Census Data for Nahiya Al-Khafsah" (in Arabic). Syrian Central Bureau of Statistics. Retrieved 15 October 2015. Also available in English: UN OCHA. "2004 Census Data". Humanitarian Data Exchange. Retrieved 4 December 2015. ^ "عشرات القتلى والجرحى بقصف جوي روسي بريف حلب الشرقي". AlAraby. 28 June 2016. ^ "Islamic State evacuating headquarters in Syria's al-Bab". ARA News. 8 September 2016. Archived from the original on 2016-09-17. Retrieved 2016-09-10. ^ "Syrian army captures water station supplying Aleppo from Islamic State". 7 March 2017. ^ "ISIS villages surrounded in Aleppo as the Syrian Army captures Al-Khafsah". Al Masdar News. 7 March 2017.